Today, DC (in conjunction with IPC Media) is releasing the first issue of Albion, with plots by Alan Moore, scripts by Leah Moore and John Reppion, art by Shane Oakley and George Freeman and covers by Dave Gibbons. Albion is about catching up with classic British superheroes of the past, and while I am sure that they will write it so that you do not have to be familiar with the histories of the characters (heck, for all I know, knowing all this might HURT your enjoyment of the comic), but I figured I would give you all a guide to the characters featured in the story anyways. First off, this guide would be in extremely weak shape if it were not for International Superheroes, whose fine site was an EXCEPTIONALLY important resource for this guide. 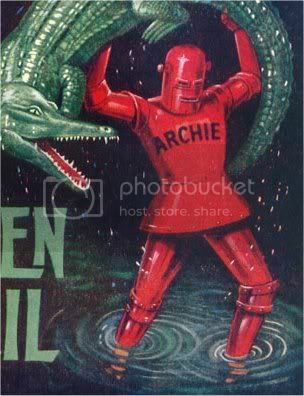 The feature of of the cover of Albion #1, Robot Archie first appeared in Lion #1, in 1952. 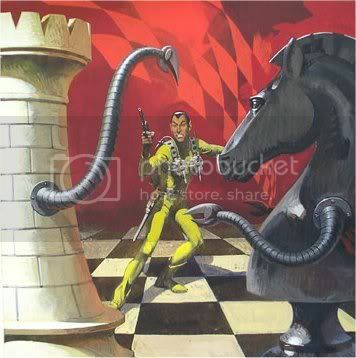 Archie was a powerful robot created by Professor C.R.Ritchie. Archie went on adventures with the professor's nephew, Ted Ritchie and Ted's best friend, Ken Dale. At first, they travelled the world seeking adventures (at first, Archie could not speak - this was fixed as the series went on), but in 1968, they began a series of adventures through TIME! 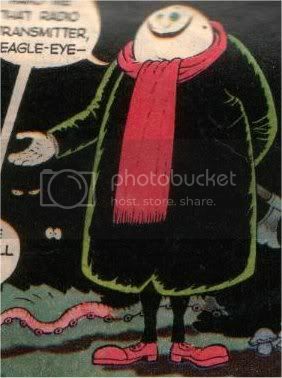 Robot Archie ceased publication in 1974, and besides some odd appearances in Grant Morrison or Alan Moore comics, he has not appeared in English comics since (this is the same for most of these characters. Moore killed off a few characters in his Captain Britain run, and Morrison did a lot of parodies in his Zenith work). Robot Archie was drawn mainly by Ted Kearnon. The Spider was a former criminal, who was just so good at being a criminal that he decided that FIGHTING crime was a bigger challenge. 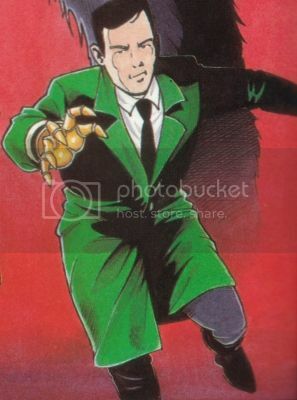 He had a suit that would enhance the user's strength and agility, and he had a gun that would shoot webs (similar to Spider-Man's web-shooters). Spider first appeared in Lion in 1965, and was featured regularly last in 1976. However, while also appearing in the same parodies as Robot Archie, Spider also was revived by Paul Grist in Jack Staff, in a very nice treatment by Grist (then again, this is Grist we are talking about here, of course it was a nice treatment). The Spider was written by (and MAY have been created by) Superman co-creator Jerry Seigel. Janus Stark made his first appearances in the page of Smash! in 1969. He was an orphan in Victorian England, where he was imprisoned in a cellar by a bad guy. His bones are like rubber, so he can contort himself to squeeze through the tiniest of spaces. Once he freed himself from his cellar prison, he met a man named Blind Largo, who taught him the tricks of being an escape artist. Now grown, Stark becomes an "escapologist." He became famous in English society for his abilities, as well as his mystery solving (often, because of his lockpicking skills and his super powers, he is suspected of the very crimes he is investigating!!!). He was created by Jack Legrand. 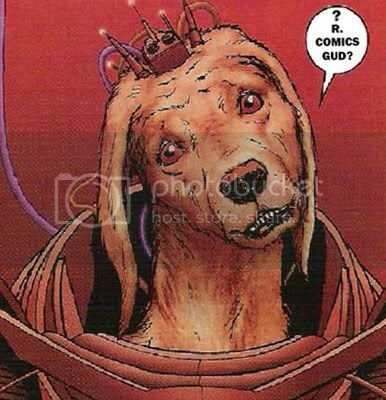 His stories were most handled by the creative team of Tom Tully (writer) and Solano Lopez (artist). Grimly Fiendish made his debut in Wham! in 1963. He was the main for Eagle-Eye, Junior Spy, who was a child super spy. He used monsters to try to take over the world, and he was always stopped by Eagle-Eye. Fiendish also usd crazy Batman TV series-esque devices to kill Eagle-Eye. The band, the Damned, wrote a song titled Grimly Fiendish, too. Apparently, there is also a band called Grimly Fiendish too, from Hertfordshire England (although one would think that they are more influenced by the Damned song than the comic book...but I do not know). Fiendish was created by Leo Baxendale. The last two characters both made their first appearances in Valiant #1 in 1962. Captain Hurricane owned a tramp steamer, until the Nazis sank it. You can mess with a man...but never mess with his BOAT! 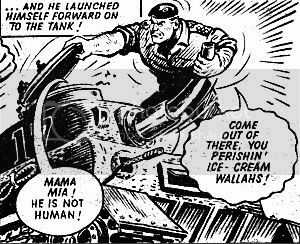 So Hurricane enlisted in the Royal Marine Commandoes, and took the fight directly to the Nazis and the Japanese armies. The angrier he got, the stronger he got - and the strongest he got was when he was in one of his "ragin' furies." Hurricane was also featured in Paul Grist's Jack Staff. and one of the good Captain in action! Scott Goodall and Jon Rose both wrote on the character. The Steel Claw is Louis Crandell, who had a prosthetic hand from a lab accident. A SECOND lab accident (see, Barry Allen's lab isn't the only accident prone area in comics!!) made it so that, when struck with electricity, Louis would become invisible - except for the hand! The Steel Claw was first a criminal, as Louis went a bit nuts due to the accident. Later, he worked as a secret agent (with devices being implanted in the hand), and even later, he was a superhero!! The Steel Claw was written by Tom Tully and mainly drawn by Jesus Blasco. Well, that is all of the characters that Leah Moore has confirmed will be appearing in the series. When I hear of any more, maybe I will come back and update it. There's a band called Grimly Fiendish too, from Hertfordshire England, I saw them a couple of weeks ago and they were rocking! I'll add that in there, too. Don't be too sure that this was unnecessary, Brian. I've just read 'Albion' #1, and there's really not much background info given on who any of the characters the comic book fan guy encounters/gains evidence of are. 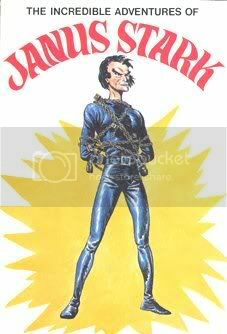 Janos Stark was also revived (after a fashion in Jack Staff) as Charlie Raven. On the whole, I was somewhat unimpressed with Albion, however, admittedly, it's very introductory so far, so it'll probably get better as it goes along. It just seems like one of those post-Watchmen neomodernist series where old silly concepts are rendered legitimate by making them all 'grim' and 'gritty'. Reminded me of an updated Spider story from a year ago which gave us a mature readers' version of Sid and his Snake... something the world has been waiting for for ages, I'm certain. I pciked up ALbion yesterday and I thought it was just awful. It not only didn't make me want to pick up the second issue, it actually made me want to give the first issue back to the store. In the background of one frame you can see the offices of Anthony Broke, Turf Accountant.. Which is a ref to the character from Tony Broke & Ivor Lott, from comics like Buster, Whizzer and chips etc.. makes me think that maybe Penny may have a connection to the character Penny Less from the same strip. Robot Archie had a second life in Holland. Bert Bus draw and wrote about 6 48-page comics. The world's largest shoe industry portals, shoes, nets to provide a flood of Air Jordan Shoes of information, NFL Jerseys and puma chaussures hommes　line trading and other information. You can find the latest and most Footwear tide of information, including NFL Jerseys, MBT shoes, nike tn, and other related content. What is Breitling? Do you know Breitling Watches? Buy these Breitling Watches sale on line. To buy ABC online.To buy ABC online.To buy ABC online.To buy ABC online.To buy ABC online.To buy ABC online.To buy ABC online. If you are archers, this is an easy and good way for you to hunt and get some FFXIV GIL. There have huge cheap ffxiv gil in our stock. Make order when you need please. And always, always, ALWAYS! Pick up what the monsters drop; this gets you a nice sum of Buy FFXIV Gil to use on skills and potions and all other necessities needed. So it is very important for you to own much FFXIV Power leveling. Remember you can Final Fantasy XIV Gil in good price from our company. Herve Leger bandage dress online store eliminates Christian Louboutin your worries. dress. The herve leger bandage dress dress highlights your perfect feminine body curve. If you wear this dress, it will send out your inherent Hermes Handbag glamour. It is specially designed for you and meets your noble Moncler taste. The factors you need to be aware of zigtech, the two most important is the durability and Comfort of the zigtech reebok. Paying for high price for Moncler from a reputable brand is not a bad idea As They must have used better quality materials that will withstand The Elements is zigtech shoes. A well manufactured jacket Will show at Signs of Reebok Easytone，easytone and easytone shoes should be easy to use. Biennials, Max Mara and art prizes too have been subjected to massive proliferation over the past few years. London alone can count at least six or seven, among which is the Max Mara Art Prize for Women. Nominations are a mixed blessing; the bright side being visibility, as well as a chance to be acknowledged by the group of fi ne brains that usually constitute wbkxdshh the judging panel; the max mara coats downside being the competition, as every prize has just one winner. Furthermore, the sometimes ambiguous relationship between artists, jurors and hosting institution often bears scrutiny.Every single max mara clothing existing prize, to a bigger or lesser degree, has experienced similar twists of fate, with arguments and protests about money, criteria, qualifi cation and integrity. All in all it's a bleak.Artists Becky Beasley, Andrea Büttner and Elizabeth Price have been announced as the three artists on the 2010 max mara weekend Art Prize for Women's shortlist. The winner of the prize will be announced at Whitechapel Gallery on March 23. The Max Mara Fashion Group established the prize in an effort to support and promote the work of female British artists. The jury max mara dresses responsible for this year's selection was comprised of chairwoman and director of the Whitechapel.Whitechapel Gallery director Iwona Blazwick has announced artist Andrea Büttner as the max mara 2011 recipient of the Max Mara Prize for Women at a ceremony at the London gallery. Büttner, who maintains studios in London and Frankfurt, will be Max Mara given a three-month residency at the American Academy in Rome and another three-month residency at the Pistoletto Foundation in Biela, Italy. The max mara clothing of work created during this time will then be exhibited at the Whitechapel Gallery next year.Iwona Blazwick said, "The calibre of work being produced by female artists working in the UK at the moment is incredible,.Famous Italian fashion designer, Max Mara, drops by Island Trader's at River Island to preview his summer line of luxurious resort Max Mara wear for men, women and children.With its purist approach to design and branding.Max mara weekend is seeing its camel coat become a recessionista favourite.If the fashion industry had a pub quiz, this question would really separate the editors from the interns. Karl Lagerfeld, Jean-Charles de Castelbajac, Dolce e Gabbana, Narciso Rodriguez and Franco Moschino have all designed for which Max Maracompany?Bing!This winter, though, this almost pathologically discreet max mara online business is on the receiving end of a slightly back-handed form of fashion acclaim.A garment that MaxMara conceived nearly 30 years ago — the women's camel coat — has become the key item of Autumn/Winter 2011.
uggfromau.com,is tend to enlighten ladies how to keep their feet beautiful in winter besides they weare ugg boots to keep feet dry and warm yet. In some areas,such as nyc in united states,toronto in canada,it is very necessary for ladies to keep their feet warm and cozy first. Uggs outlet focus on this but the other feature of the uggs outlet is let every ladies wearing ugg boots beautiful in winter also. With this combination of warming and cooling, the Ugg boot is the perfect boot for all occasions. Add to this fact that the sheepskin material used to make this boot is generally more comfortable than the standard leather used to make the common boot, and you have a warm and comfortable boot for all seasons. In every winter, womens are crazy for shopping uggs boots because they hate being beated by the cold. A cozy,warm uggs boot can easily make their feet warm and then warm the whole body.They shop uggs boot from ugg malls,ugg stores and they hunt the kids emu boots and kids uggs ,mens sheepskin slippers or mens hiking boots sheepskin to prevent all families from cold.That is girls’ nature,to satisfy with all your interests we provide ugg boots on saleorcheap ugg boots with top quality. ordered the "tall" moncler outlet pair so you can tuck your jeans into them and wear them with skirts as well. the feeling of sheepskin moncler sale as much as you do.great buy!. uggs clearance In terms of ride, this AMT transmission can not always be compared with the Mercedes-Benz brand, each shift is hard not to be car noticed Ugg Classic Cardy boots.No. 2 is the American reality show gold Qatar Queen Alexandra, Uggs Outlet married 72 days and flash flash off, money, marriage, divorce, pocketed the money, but also broke the news of two fundamentally false marriage; No. 3 Jennifer Lopez and Mark Anthony's seven-year marriage comes to an end, so the media dumbfounded, because they have been openly show affection, do not see signs like divorce ugg boots clearance. Ace Maxs ini memiliki bahan utama yang dihasilkan dari kekayaan sumber alam Indonesia yang dipilih dari yang terbaik sehingga menghasilkan khasiat yang sangat luar biasa ampuhnya. Thank you obat thalasemia for presenting something obat herbal tumor telinga that is best, and this gives an idea for all of us a lesson that we always obat kanker getah bening learn from someone even if that person is not obat herbal kista coklat | obat pegal linu known to us, and success always for you who have inspired us all! Thank you for presenting obat kanker getah bening something that is best, and this gives an idea for all of us a lesson that we always learn from someone even if that person is not known to us, and success always for you who have inspired us all!